„Sharing is caring“ may be the secret motto of an event I recently had the opportunity to join. 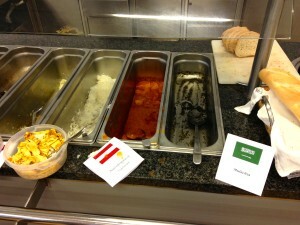 Foodies among the employees of a research institute located in the middle of the 9th District had invited colleagues and friends to join a cross-cultural „Food Festival“. The idea may sound quite simple, but is nevertheless ingenious: In a working and studying environment of 30+ nationalities an evening to bring traditional food of ones own home country is not only a nice way to socialize with colleagues and build meaningful connections. It is also a fun way to re-connect with home tastes and smells which may be a quite missed aspect of ex-pat life in a foreign place . It is an opportunity to start a dialogue about culture and differences, but with an entirely positive framing. Not least, it makes addressing cultural differences into something very tasty and yummy, which I tried and tasted quite intensively. 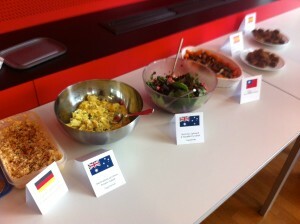 How nice that everybody can cherish their own roots and culture while sharing what they prepared with other guests! 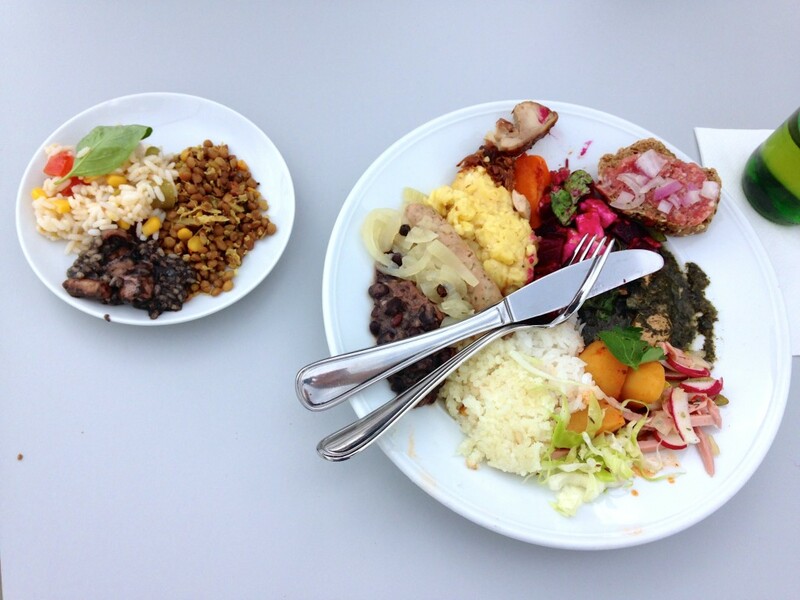 This positive corporate example of how food can contribute to a more intense but at the same time relaxed exchange and dialogue about cultural differences stands in line with other initiatives: Hanni Rützler`s Migration Culinaire (on the blog here and here ) is one of them. 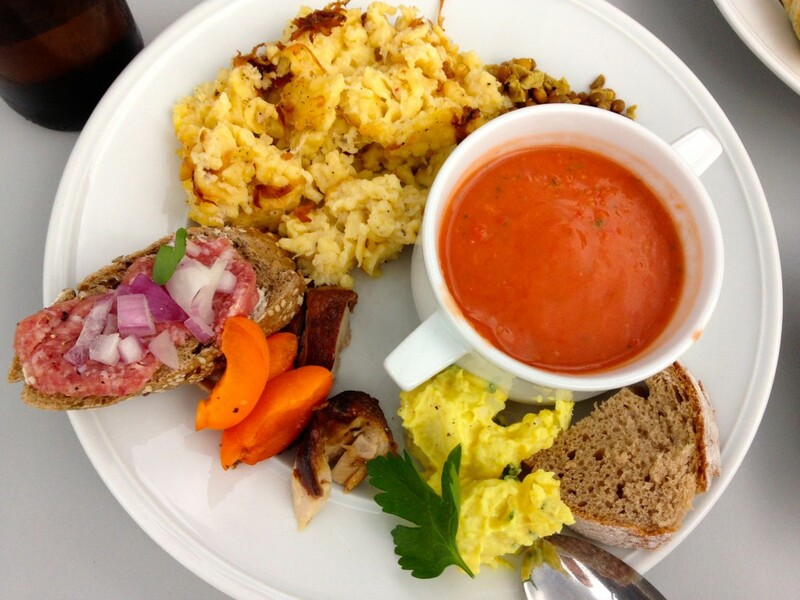 Another example is the „Montags-Gasthaus“ in the 15th District, where people of the neighborhood cook together and then serve the food to passers-by and friends (More information about this initiative of GB Stadterneuerung, Caritas and Leila- Leihladen may be found here). But now, enough of the talk, let`s have a look on what`s cooking. Here are round 1 and 2 of a mixed mains and starters platter featuring – as far as I remember (sorry, guys, if I got something wrong! ): German Hackepeter-Brote next to tea-smoked chicken with apricots from Hongkong (a revelation! ), next to coconut rice and a Brazilian Feijoada. Carnivores may have sunk their teeth into German Blaue Zipfel, Saudi Muluchia with pureed herbs and juicy chicken or a Croatian seafood risotto with squid ink while vegans and vegetarians have feasted on exotic lentil salad or Mediterranean rice salad or spinach and beetroot salad with blue cheese and raspberries from Tasmania. To complete the feast, wash down a Portuguese Gazpacho, Austrian Kasnocken and an Australian-German Kartoffelsalat (on the plate you see tea smoked chicken and Hackepeter again!) with a cold beer. Be careful to leave room for dessert. Sweet memories of home may easily be associated with sweet treats. Which better way to treat homesickness or bait others into your country`s cuisine than with dessert? 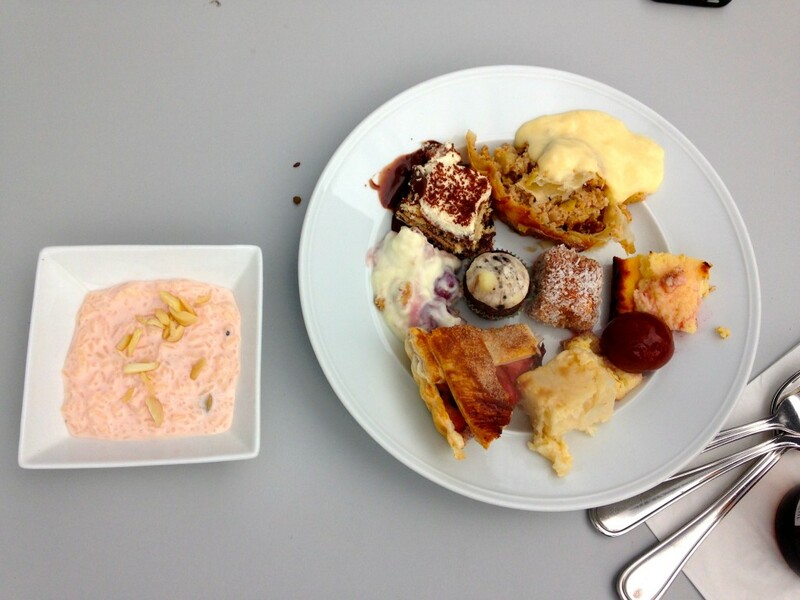 Here is the best of selection of the dessert bar that absolutely overwhelmed me. Faced with such treats as Belgian chocolate layer creme pudding, German Herrencreme, Portuguese cake with plum compote and sweet brine and Austrian Apfelstrudel mit Vanillesauce, I nearly forgot to jot down the names of sweets I also had: American pie, exotic coconut cake, Polish delights and Indian rice pudding with cardamom and rose water. High on sugar I turned to the initiator and host of the evening who is a formidable producer of homemade mead. I always love to talk to fellow fermatationists, even more so as I had never heard of fermenting honey and water to a delicious dessert wine. As probably most of you know, normally I do not have a sweet tooth. 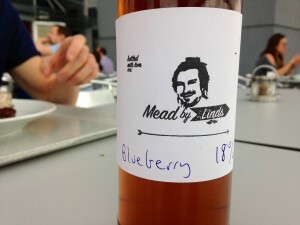 But if Linds ever goes into production, I will get a selection of his flavors: Blueberry has a pleasantly bitter note to balance the sweetness, the honey itself has more complexity to it than many other sugar sources, so the mead was interesting to taste and combined well with the dessert platter.